This redesigned Halloween tract tells children that the truths of God's word are better than any treat. 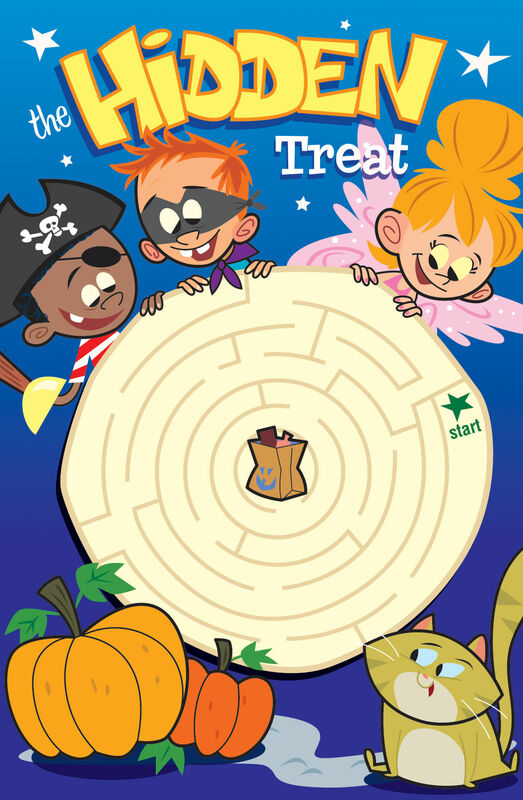 It didn’t take you long to discover there’s only one way through the maze to the hidden treat! Now, do you know what doing a maze and knowing God have in common? There’s only one correct way to do it! When God’s only son, Jesus, was on earth 2000 years ago, he said “I am the way….no one comes to the Father except through me” (John 14:6). If he is the only “way” to God, how do you get started? Begin by realizing that you’re going the wrong way! God’s instruction book, the Bible, says that “we all like sheep have gone astray, we have turned every one to his own way” (Isaiah 53:6). Wrong “ways” include doing, saying, and thinking things that displease God. Things like disobedience, lies, and selfishness “sins.” He says we “all have sinned” and sins’ consequences must be paid—“the wages of sin is death” (Romans 3:23, 6:23). Thankfully, the way to God isn’t hidden! The Bible says “God so loved the world that he gave his only Son [to die for us], that whoever believes in him should not perish but have eternal life” (John 3:16). Though Jesus never sinned, he took the consequences we deserved. God accepted Jesus’ death on the cross in payment of the penalty for our sins! Because Jesus died and then rose again three days later (1 Corinthians 15:3-4), we can become part of God’s family. To those who truly believe Jesus died for them, he promises “I give them eternal life and they shall never perish” (John 10:28). Everlasting life is a gift from God that begins with belief and never stops. God also wants to make your life more meaningful now. He wants to help you obey him, as well as your parents and teachers and show forgiveness and love to others, then join him in heaven some day. Becoming part of God’s family is the greatest decision you can ever make!